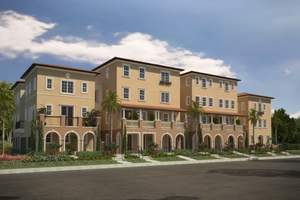 SAN DIEGO, CA--(Marketwired - Dec 10, 2013) - This Saturday, December 14th, homebuyers will have their first opportunity to purchase at Atrium at The Spectrum by William Lyon Homes. With prices anticipated to start from the mid $300,000s, San Diegans who are eager to buy one of the neighborhood's innovative condominiums before the model grand opening are encouraged to take advantage of valuable pre-sale offerings when the Sales Gallery opens at 10 a.m. To get started, the most important first step is to register your interest at www.lyonatrium.com to secure your place on the interest list. For more information, call Atrium today at 858.560.0915. "Atrium's Sales Gallery has welcomed more than 1,000 guests who have expressed tremendous interest in this neighborhood. As a result, we anticipate a terrific response to the pre-sales release and imagine this release will sell very quickly," said Lesley Pennington, Vice President of Sales for William Lyon Homes. "While the professionally decorated model homes are currently slated to open early 2014, visitors to the Sales Gallery have the exciting opportunity to view 3D virtual tours for a closer look at the architectural layout and detailing of each Atrium floorplan. The Sales Gallery is also the only place where prospective buyers can utilize William Lyon Homes' innovative HomeStart tool to match their personal expectations and budget to the design best suited for their priorities." San Diegans who are ready to stop renting and start owning will find Atrium the opportunity they have been waiting for. Don't miss the pre-sales release this Saturday and start looking forward to 2014 enjoying a brand new home in a convenient location where business and leisure are within easy reach. Atrium's new home designs range from approximately 1,166 to 2,410 square feet, with 2 to 4 bedrooms, 2.5 to 3.5 baths, welcoming front porches, spacious master suites with luxe baths and large walk-in closets. Select floorplans offer a loft option or entertainment room. Spacious great rooms afford casual entertaining and terraces extend one's living space outdoors. Homebuyers will appreciate the advantages of long-term warranties and all new construction, coupled with the commitment of an established homebuilder. Atrium's commuter-friendly setting in the heart of Kearny Mesa is desirable for local professionals who will be conveniently located near major employers, including Northrop Grumman, National University, Sharp Hospital and Solar Turbine. Atrium's proximity to the 163 Freeway also means Mission and Fashion Valleys, downtown, popular beaches and San Diego's favorite dining, retail, and entertainment destinations are within easy reach. Recreational outings can be enjoyed at Balboa Park, Tecolote Canyon Natural Park and Nature Center, and the Tecolote Canyon Golf Course. To visit Atrium's Sales Gallery from the I-805 or Hwy 163, exit Clairemont Mesa Blvd. (heading east), turn right on Kearny Villa Road, left on Lightwave Ave. and the Atrium Sales Gallery will be on your right. The Sales Gallery is open daily from 10 a.m. to 5 p.m. For more information, please call 858.560.0915. Visit Atrium this Saturday to take advantage of valuable pre-sale offerings.